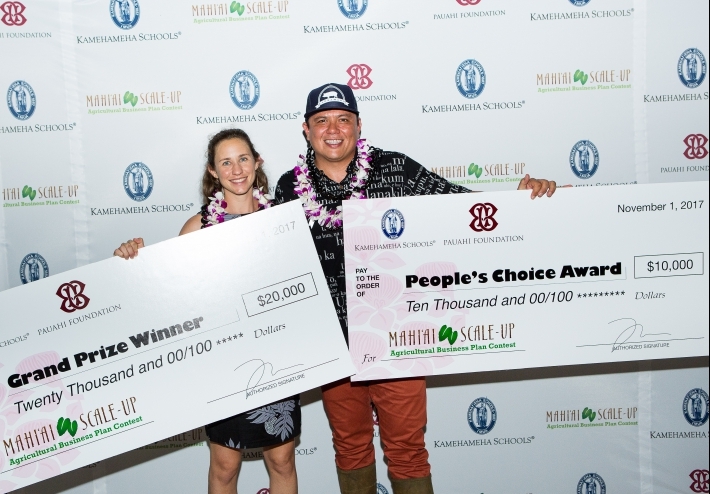 Dana Shapiro of Māla Kalu‘ulu and Brandon Lee of Kaunāmano Farm celebrate after winning the 2017 Mahi‘ai Scale-Up $20,000 grand prize and $10,000 People’s Choice Award. Māla Kalu‘ulu, a cooperative business located in Ke‘ei, Hawai‘i, and previous Mahi‘ai Match-Up winner that cultivates ‘ulu (breadfruit) and ‘ōlena (turmeric) and farms via principles developed by Hawaiians applied to contemporary agriculture, was awarded the 2017 Mahi‘ai Scale-Up grand prize of $20,000 by Kamehameha Schools and the Pauahi Foundation (PF) at Hawai‘i Food & Wine Festival’s “Raw & Wild in the Tank” event at Our Kaka‘ako on Nov. 1. Kaunāmano Farm, a Hilo-based producer of Berkshire hogs and previous Mahi‘ai Match-Up winner that uses a holistic approach predicated on pasture management and rotational open-air grazing, earned the Mahi‘ai Scale-Up People’s Choice Award of $10,000 via a live vote by event attendees. With Hawaiian culture as a foundation of KS’ educational mission, Mahi‘ai Scale-Up is just one of the ways that KS strives to responsibly steward approximately 364,000 acres of land on which agriculture plays a significant role. The Mahi‘ai Scale-Up agricultural business plan contest showcases KS’ agricultural initiatives, including food security and sustainability, and highlights the stellar farmers and entrepreneurs currently utilizing the ‘āina. KS and PF took the successful Mahiʻai Match-Up agricultural business plan contest to the next level via Mahi‘ai Scale-Up in an ongoing effort to support the state’s sustainable agriculture movement, and ongoing education and training for this new generation of farmers. The competition made possible thanks to partner sponsors: ‘Āina Sponsor Cades Schutte LLP; Wai Sponsors Ulupono Initiative, King’s Hawaiian and Carlsmith Ball; and Mahi‘ai Sponsors R.M. Towill Corporation and Alston, Hunt, Floyd & Ing. Mahi‘ai Scale-Up targets seasoned individuals and entities within the agricultural industry and challenges them to expand their operation by implementing a new program or initiative that enhances the business. The Scale-Up concept builds upon the foundation of Mahi‘ai Match-Up, which over the past several years, has awarded five-year agreements to seven startups that utilize KS lands and seed money to execute the strategies and initiatives presented in their business plans. Through this initiative, KS plays a major role in decreasing Hawai‘i’s dependence on imported food and agriculture products. “We need to look at sustainability not as a flavor, or as a marketing buzz word, but as a history of the Native Hawaiian people who were able to live in these islands while thriving and being successful in the most isolated land mass in the world,” said Brandon Lee, who operates Kaunāmano Farm with Ka‘ikena Scanlan. “The Mahi‘ai Scale-Up allows us to let everybody know what we’re doing on the farm, and it’s great for Hawai‘i. It takes work, and I’m willing to do the work. The additional Mahiʻai Scale-Up semifinalists were: ‘Aina Pono Livestock & Land Maintenance LLC, a Hilo-based company that raises goats and sheep for food consumption and to keep as pets; Island Mana‘ia LLC, which specializes in the production of value-added cassava snack products and is based in Hawai‘i Kai; Ka Papa O He‘e Kalo, a cultivator of kalo (taro), ‘awa and cacao via modern and traditional farming practices based in Punalu‘u, O‘ahu; and Keiki and Plow, a farm in Hawai‘i Kai that grows a variety of organic vegetables and fruits in addition to offering organic eggs through immersive agriculture. The Mahi‘ai program has been recognized as a creative and innovative way to encourage aspiring, and in the case of the Scale-Up, seasoned farmers to develop their ideas and plans to address Hawai‘i’s food security issues through sustainable practices. The process has also led to the creation of the Mahiʻai Scholarship, which helps deserving and motivated students entering a field related to agriculture pursue their goals. KS stewards some of the most fertile and valuable agricultural land in Hawai‘i and is engaged in an ongoing effort to lease those lands to talented farmers in support of the state’s sustainable agriculture movement, and ongoing education and training for this new generation of farmers. The Mahi‘ai Match-Up Agricultural Business Plan Contest and Mahiʻai Mentorship are helping KS find talented, innovative farmers who want to grow food and help decrease Hawai‘i’s dependency on imports. Two finalists have been selected in the 2016 Mahiʻai Match-Up agricultural business plan contest dedicated to supporting Hawaiʻi’s sustainable food movement. Tickets and sponsorships for the July 30 Mahiʻai Match-Up Fundraiser Gala are available at www.pauahi.org. The Mahiʻai Match-Up agricultural business plan contest supports Hawaiʻi's sustainable food movement. Find out what the contest's past winners are doing now! KS and the Pauahi Foundation invite farmers, ranchers, and other agricultural entrepreneurs to enter the contest, which will award $35,000 in seed money! The entry deadline is Feb. 29. Two budding young businesses will share $40,000 in seed money as the winners of the Mahi‘ai Match-Up Agricultural Business Plan Contest sponsored by KS and the Pauahi Foundation. KS and Ke Ali‘i Pauahi Foundation are sowing seeds of sustainability among farmers by sponsoring Mahi‘ai Match-Up, an agricultural business plan contest aimed at decreasing the state’s dependence on imported food. Business plan summaries are being accepted through August 15, 2014. The KS contest is aimed at increasing the state's food production and decreasing its dependency on imported foods. Winners also received five years of waived rent on KS land.